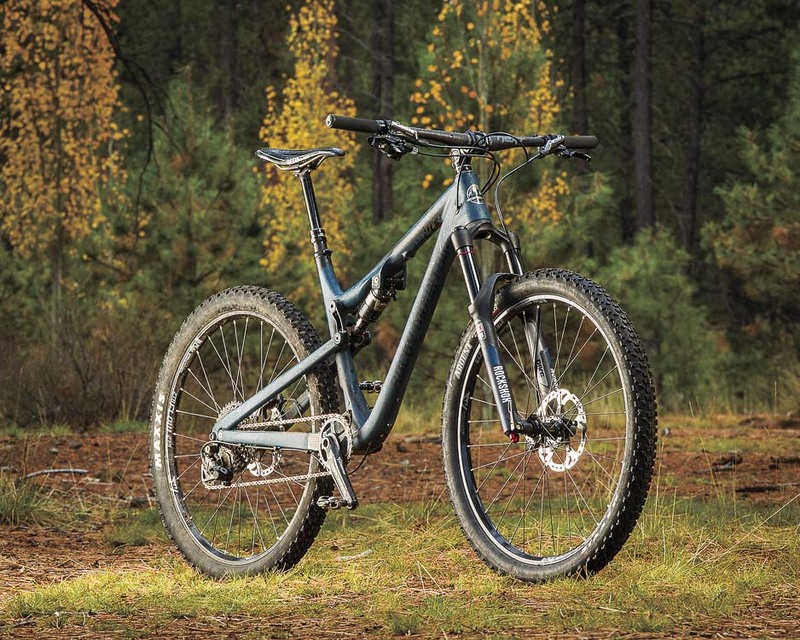 The new Rocky Mountain Thunderbolt 790 MSL BC Edition was one of the most raved-about bikes at this year's Bible, and it was definitely my favorite. This is saying a lot, as the array of bikes we rode in this year's test was, pound for pound, the strongest bunch in The Bible of Bike Tests' six-year history. I wasn't the only tester who was struck by the Thunderbolt's lightning-fast handling characteristics and penchant for speed and precision: Each tester who skidded its 650b wheels into the parking lot after running riot down the fast-and-loose lava-rock chutes of our test trail was panting like a dog in midsummer heat, with a wild look of possession in his eyes that immediately betrayed the 'code of silence' we strive to keep prior to our evening 'Roundtable Reels' debates. When it came time to actually discuss the Thunderbolt, among the many superlatives that were lavished on the bike, the simple word 'fun' came gushing up the most. One tester and I bonded over our shared belief that Rocky Mountain Bicycles have always seemed to make bikes that are all about fun. What was so fun about the Thunderbolt? It was the bike's cross-country-esque build with its agile, all-mountain disposition. We rode it with the RIDE-9 geometry adjustment in the furthest-forward position, giving us the slackest-possible head angle and lowest bottom-bracket height. The 67.2-degree head angle was the sweet spot for the Bend-area trails–just steep enough to keep the front end obedient while climbing, yet sensibly slack enough to really let loose on wooly descents. Couple this with the short, 16.6-inch chainstays of our size-medium test model, and it's no surprise that the Thunderbolt felt so snappy and responsive. We had questions about the new bikes before we even got our test rigs, so we sent out a few queries—the kind of things we thought you might be asking yourself when you're looking at this bike. Then we sent out another round of asks if any major questions or issues came up during testing. Here's the feedback we received from Rocky Mountain Bicycles content marketing manager, Brian Park. VERNON FELTON: What were the key riding traits that you were trying to impart on the Thunderbolt when it was under development? BRIAN PARK: We wanted to create a bike that retained our trademark capability and agility, but was also lightning fast when you put power to pedals. The goal was off-the-top suppleness, with good support throughout the mid stroke, and then a very progressive end stroke so you can still get rad. VF: How did you (from a design and engineering perspective) make those goals a reality? BP: For the MSL version of the Thunderbolt we increased the anti-squat and tweaked the rate curve from the original aluminum one. The curve we chose allows riders to run slightly more sag than they normally would (I run mine at 27 percent to 32 percent), but still retain both great pedalling performance and overall progression. VF: What sets the Thunderbolt apart from other bikes in this niche? BP: We’re excited about the usual things: lighter, stiffer, better pedaling, more capable, more adjustable, etc…RIDE-9™ is a big deal on it. The bike's stiffness-to-weight ratio is also pretty impressive. Honestly, we feel that the Thunderbolt MSL is the best performing, most complete package out there. VF: Who is the ideal rider for this bike? What kind of ride applications does it excel in? The trail bike category is diversifying a good deal of late and terms like "trail" and "cross-country" mean very different things depending on where you live. Just wondering where the new bike fits into the scheme of things since it straddles both the XC and Trail worlds. Hell, when you can slacken the head angle to 67 degrees on the carbon models, the new Thunderbolts practically straddle the enduro world (from a geometry perspective, that is). BP: Oh man. Big question for sure, and tough since it’s a pretty versatile bike. Ultimately it’s a bike for people who are tired of the classifications—folks who enjoy hammering up the climbs, but want to smash the descents too. Throw a slightly longer stem on and steepen the bike up and it’s absolutely an XC weapon for Strava warriors looking for pedalling efficiency in a longer travel package. Bring it to BCBR, race some stage races, crush local group rides, for sure. And then, on the other end of the spectrum, our Enduro guys may use it at some of their local races this year. Run it slack and with a 130-millimeter travel fork, and it absolutely blasts. Of course it’s out of its element at more technical EWS tracks like Whistler, but we’ve seen a huge response from riders wanting to ride this bike more aggressively. VF: How did people respond to the bike (sales wise) last year? Bikes that blur boundaries are usually fun as hell to ride, but sometimes confusing for consumers to grasp initially. BP: People absolutely “got” what the Thunderbolt was all about, right out of the gate last year. It was a unique option for people who don’t shoehorn themselves into specific groups as riders—that is to say “most of us.” That response proved to us that there would be demand for this MSL version. VF: RIDE-9 is offered on some of Rocky's aluminum models, such as the Instinct. I was wondering why it's strictly featured on the carbon "MSL" Thunderbolt models but not the aluminum ones. BP: It was clear that lots of riders wanted to get rad on the Thunderbolt, so we made sure to bring RIDE-9™ into the mix for the MSL frame design. The non-MSL models may see that particular update in the future, but the reality is that the aluminum Thunderbolt is a great bike at a lower price-point, and adding RIDE-9™ would add cost in development and manufacturing. VF: There are no traditional bearings on the new MSL Thunderbolt frames. You guys say your bushing system is lighter, stiffer and less maintenance than a cartridge bearing set up. How is that true? BP: Essentially other bushing systems just tighten the two bushing surfaces together until they’re tight enough they won’t come apart, but that causes huge amounts of preload stiction. Our patented system uses an alloy insert that bottoms out on itself to control the preload on the bushings and eliminate those problems. It’s frustrating that other systems have given frame bushings such a bad name when doing them right provides so many stiffness, weight, and maintenance advantages. The other cool thing on Thunderbolt is the Pipelock™ main pivot. Using a design inspired by the old Pipeline [the bike I drooled most over in the 90s! ], the Thunderbolt MSL’s main pivot is an expanding-collet system that gives the bike the widest—and therefore stiffest—pivot stance possible. VF: What's going on with the "next generation" BC2 pivots? How are they different from the ABC pivots? BP: We made them bigger, they’re not angled at 45° anymore, and we added grease-ports to make maintenance even easier. Meanwhile, we still use our ABC™ pivot design in places where there’s an advantage to a more compact pivot, like at the chainstay pivot. Another thing BC2 pivots allowed us to improve on the Thunderbolt MSL is that the shock assembly can be dropped straight out of the link, making it much easier to remove for shock swaps or other maintenance. Palmer should find the Thunderbolt much simpler to work on!